Each fall, Wichita’s Bradley Fair becomes more than a shopping and dining destination: it transforms into a world-class alfresco art gallery free to explore. Invited artists from across the United States set up booths along the Bradley Fair Parkway, the street separating the shopping center from the nearby residential neighborhood and office complex. 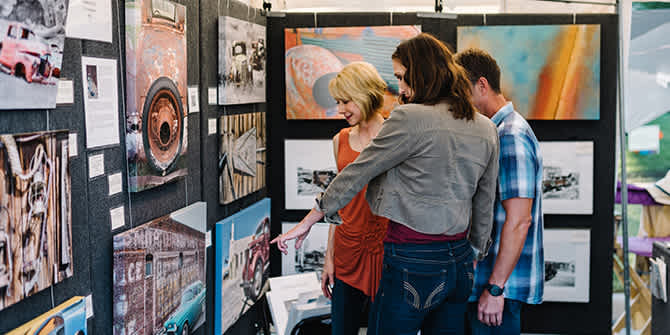 For three days, you can view and purchase original fine-art works in a wide variety of media while enjoying art-inspired entertainment and activities for all ages. The eighth annual Autumn & Art at Bradley Fair is Sept. 15-17. The juried art event is free and open to the public from 6 to 9 p.m. Friday, 10 a.m. to 7 p.m. Saturday and 10 a.m. to 5 p.m. Sunday. This year’s event features 98 artists from 22 states, including 31 Kansas artists. Original works will be available in 14 artistic media, including jewelry, painting, glass, fiber, ceramics, photography and woodwork, among others. Artists were invited to the show after evaluation by a panel of expert jurors, and those 98 artists will compete for cash awards totaling $7,500. Click here for a full list of media and artists at this year’s event. Look for Artie, the art-collecting squirrel, to find activities geared for kids. Artie’s Art Studio offers free hands-on art projects directed by Mark Arts educators. Artie’s Clubhouse is a kids-only gallery for young collectors-in-training with artwork priced for a kid’s budget. Throughout the parkway, you’ll find Artie’s Masterpiece Games: free games and photo opportunities aimed at introducing kids to classic artworks while getting silly at the same time. Paddle boat rentals will be available to take a people-powered spin around Bradley Fair Lake. Also, check the demonstration tent on-site to see the day’s schedule and then stop by to see artists throwing pottery, painting or sculpting clay. Head to Autumn & Art’s Culinary Pavilion for edible art. Here you can purchase a bite to eat from Bradley Fair restaurants. Wine, beer and soft drinks will be available to enjoy as you stroll the parkway. From 10 a.m. to noon on Saturday and Sunday, drink your art during the Art of Bloody Marys build-your-own bar. Plan now to kick off the fall season with Autumn & Art, one of the area’s largest juried fine arts shows!